Once Hawkgirl jumped aboard the CW’s upcoming Legends of Tomorrow series, we knew it was only a matter of time before her beloved Hawkman joined the fray. Now, we’ve learned that the winged warrior isn’t just coming to the aforementioned time-travelling team-up series, but will also show up on sister shows Arrow and The Flash as well! Considering Legends of Tomorrow doesn’t debut until early 2016, it’s likely that Hawkman will show up on Arrow or The Flash first, in order to set up his character. The same will likely happen for Ciara Renee’s Hawkgirl, who had a brief blink-or-you’ll-miss-it appearance in The Flash‘s season one finale. It’s unknown when Hawkman will show up or who will play him, but we do know that he won’t go through too much of a character revision. According to EW, Hawkman will be “charismatic and wise beyond his years.” He’ll also be “a natural born leader with an abundance of charm and confidence.” In the comics, Hawkman, a.k.a. Carter Hall, is actually from Ancient Egypt and was cursed – along with Hawkgirl – to be resurrected again and again for all of time. The CW adaptation will take a page out of the Hawkman: Endless Flight comics, where Carter retained memories from each of his past lives, while Kendra Saunders was instead born anew, having no idea of who he was. 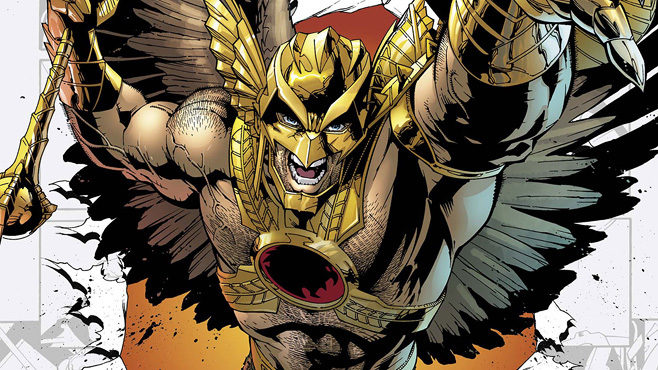 With each of the upcoming seasons for Arrow and The Flash now heading into production, we’ll hopefully have some new information on Hawkman in the coming weeks. In the meantime, let us know how you feel about this news in the comments section below. The Flash will return for its second season on October 6th, 2015, while Arrow‘s fourth season will bow the next day, on October 7th.